Woke up on Saturday morning and was in the best mood EVER!! 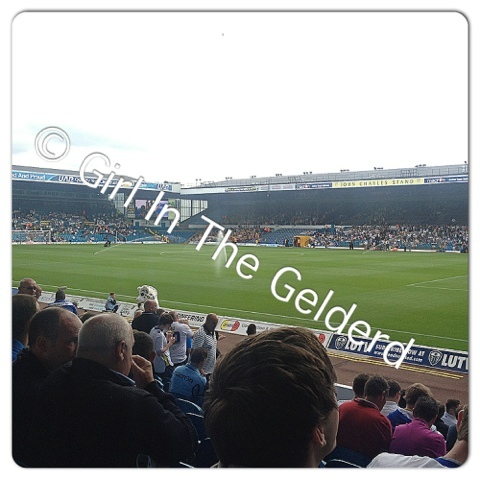 I was so excited and couldn't wait to get to Elland Road for the first match of the season. Words can not describe how giddy I was when I got inside the ground, I felt like a kid at Christmas, even more so when I got sat in my seat. We watched the players warm up, warm being the operative word, it was bloody roasting, and slowly but surely the stand began to fill up with familiar faces, faces you know personally and faces you don't, but without them, it wouldn't be the same. As the players came out, the noise was unbelievable for the amount of us there, the atmosphere was back and there was optimism in the air. A minutes applause was held and respected by all, for Leeds United fans that passed away over the summer. Lee Peltier was given the Captain's armband for the match, but we are still none the wiser as to whether he is the permanent Captain. The whistle blew for the start of the match, and we started really well, we looked sharp and in control. The chances were coming thick and fast for us and we nearly went 1-0 up inside the first 15 minutes when Luciano Becchio passed to a fast approaching Ross McCormack to head home the first, however the ball went slightly wide and it was a goal kick. We looked deadly and the whole team were doing their job in all parts of the pitch. Young Sam Byram had probably the hardest part to play, marking Matt Jarvis who is centre of speculation at the moment as West Ham have been trying to lure him back to the Premier League. Yesterday however, he looked pretty average and never looked like someone we couldn't deal with. It is so refreshing to have a keeper like Paddy Kenny, his kicking was fantastic yesterday, and that showed when he kicked the ball upfield to a waiting Ross McCormack who crossed it in to Becchio to finish with a great header and get the first, and only goal of the match. Usually when we score an early goal, we find it hard to defend, and usually let one in at the other end in very quick succession, however, yesterday was very different and even though Wolves were trying to get into the game, we were solid defensively. Paul Green was having a fantastic match but his Championship debut for us was cut short just before half time when he succumbed to a knee injury he'd sustained about 5 minutes earlier. He was replaced by El Hadji Diouf. Half time came and a lot of us found ourselves looking at each other and talking about how surprised at the quality of the football was we had just played, but we knew Leeds United, and we were preparing ourselves mentally for a tough second half. We started the second half brightly and had a couple of chances early doors however, it was clear that Wolves had come out and had a little more fire in their belly than they did in the first half, Peszko almost equalled the odds but Byram was there to see off the danger. Our work rate slipped a little in the second half, and Peszko came close to scoring again, we were letting Wolves in to the game a little more than I was comfortable with and we were understandably looking tired. Warnock decided to change it on the 75th minute as Ross McCormack made way for Tom Lees to come on, after recovering from an injury that kept him out of last weeks cup tie against Shrewsbury. 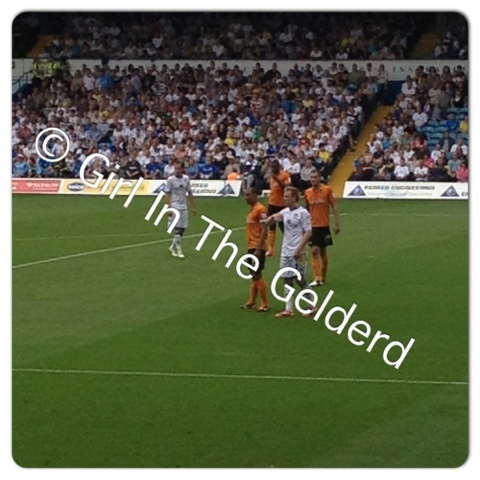 The closing minutes of the game belonged to Wolves as they worked hard to try and get an equaliser but to no avail. Byram almost got a goal for himself on the 88th minute after moving into midfield with a shot from about 25 yards out, we know he can hit them, as we saw in pre-season, not this time however, and the game continued. The board went up for added time, which was 5 minutes, which seemed like forever!! Probably the most promising shot on target for Wolves was in the 2nd minute of added time as the post seemed to come to the rescue after a header from Doumbia, however, a free kick had been given as Doyle brought down Peltier. The whistle blew for full time, and we were relieved and pleased about how we'd played for most of the game. Byram did so well, he had such a tough task marking Jarvis and he looked like a regular, I am always happy when we bring someone through the youth and they get a chance in the first team, I think he will play his heart and his soul out for this team, looking at him yesterday, it was hard to believe he is only 18!! The only player I am going to be quite critical of here is Aidy White. White has the pace to hurt a team, blistering pace, he can skip away from opposing midfielders, but often manages to lose the ball instead of lifting his head and trying to find a pass to waiting attacking midfielders/strikers. I think it will come in time, we have to remember, it was the first match of the season!! We did what we needed to do and we did it well, next match is Blackpool away, loving the fact that it is on Tuesday night, so I don't have long to wait for another fix ;o) I think though, this will be a much tougher match than yesterday and we will need to stay defensively strong as their winger Thomas Ince, scored two yesterday in Millwall.